Good product, but started to dry my hair out. Used it off and on for several years, but cannot use it continually. 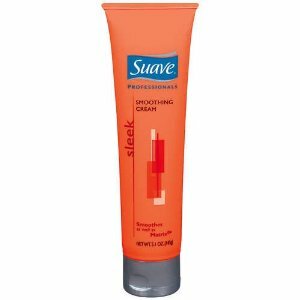 I love Suave Professional Sleek Anti- frizz cream. I use it every day. I like the scent . It does not weigh down your hair. It controls the frizz..
Love it too! I had a shampoo for my dog and it smells exactly the same :) That was kinda weird for me, but hey, great stuff ! Wonderful product! Use on myself and my family on a regular basis. Works wonders on frizzy hair.